March 3rd from 12-7 PM. The first Parsons-wide book fair will present recently-published books written, edited, or featuring work by more than 40 full-time and part-time faculty members, representing each of Parsons’s five schools. Publications range from illustrated children’s books and limited edition artist’s books to exhibition catalogs, reference books, textbooks and scholarly monographs. This event has been organized by ADHT’s Laura Auricchio with assistance from Jennifer McHugh and in collaboration with Barnes and Noble. 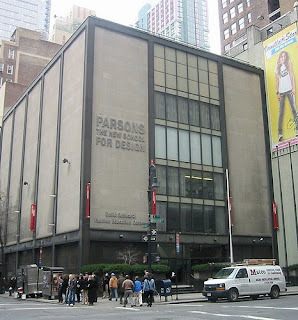 Free and open to the public.The first Parsons-wide book fair will be held in the Sheila C. Johnson Design Center’s “Crit Space,” located on the ground floor of 2 West 13th Street, on Wednesday, March 3rd from 12-7 PM. A reception will begin at 5 PM. The fair will present recently-published books written, edited, or featuring work by more than 40 full-time and part-time faculty members, representing each of Parsons’s five schools. Publications range from illustrated children’s books and limited edition artist’s books to exhibition catalogs, reference books, textbooks and scholarly monographs. Visitors will also be able to view the “Storyteller” exhibition, in the Sheila C. Johnson Design Center’s Anna-Maria and Stephen Kellen Gallery, throughout the course of the fair. This event has been organized Laura Auricchio with assistance from Jennifer McHugh and in collaboration with Barnes and Noble. Free and open to the public.